Can Improve Circulation - The Task Master Adjustable Foot Rest is designed to provide a resting platform for users seated on higher than average seats such as drafting stools or bank teller seating. Because these seats raise the user above the range that more common footrests are able to reach, circulation can be cut off on the back of the thighs. The Task Master addresses this by providing a supporting platform that can adjust from 5.5" to 15". Supports Proper Foot/Angle Alignment - Many office workers sit with one foot forward of the other, putting this foot into a position called plantar flexion. Over time, sustained plantar flexion can cause the calf muscles to become tight and stiff which, in turn, can lead to a range of uncomfortable symptoms in the foot. The 8° angled platform on the foot rest ensures that when users rest their feet they are not in the position of plantar flexion. Improves Upper Body Posture - The Task Master Adjustable Foot Rest provides users with a stable and supportive surface that encourages them to correctly utilize the back of their chair rather than "perching" on the front edge of their seat. This improved posture can reduce the risk of upper back, shoulder and neck pain. Because the Task Master Foot Rest can be positioned as high as 15" even those of shorter stature can reap these benefits. 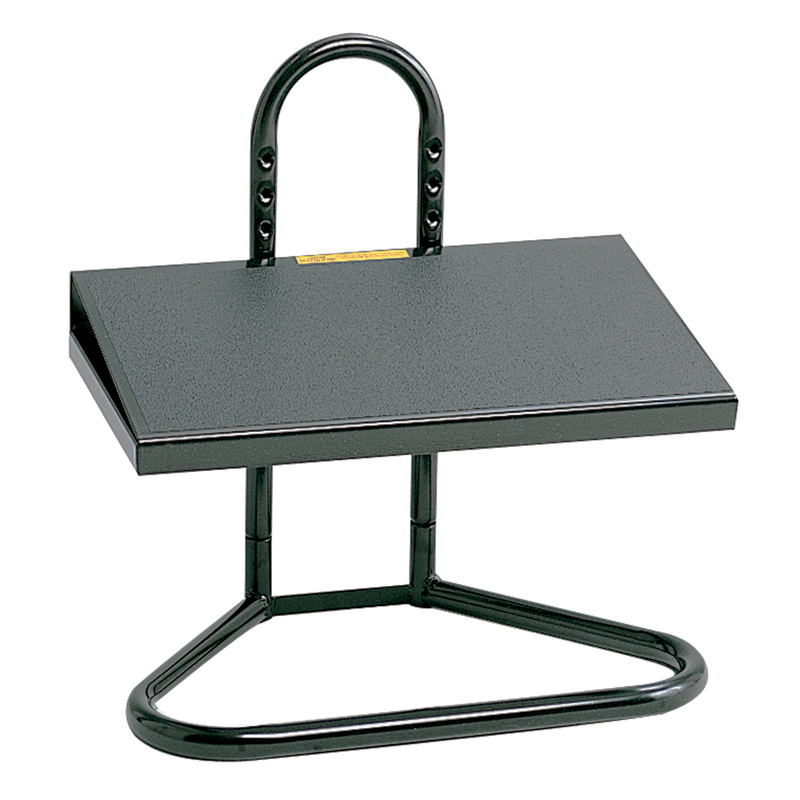 Easy Adjustment: Height adjustment of the Task Master foot rest platform is easily accomplished with minimal effort. Two locking tabs insert into the upright column to support the platform, locking it into position as the front edge is lowered into place. Wide Range of Height Adjustment: The Task Master Adjustable Foot Rest offers 9 height settings ranging from 5.5 - 15" from the floor. This means that it can meet the foot rest requirements for virtually all users who are seating on drafting and teller style raised seating. Fixed 8° Tilted Platform: The slightly tilted platform provides a comfortable resting surface as well as ensuring that users are not subjected to a position of plantar flexion. Oversized Foot Platform: The large 20" W x 12" D surface on the Task Master Adjustable Foot Rest offers plenty of support feet of any size. Textured Non-Slip Surface: For safety and to keep feet comfortably positioned the surface of the Task Master Adjustable Foot Rest has a textured non-slip coating. Robust Construction: The Task Master Adjustable Foot Rest features all-steel construction. Materials: Durable tubular steel frame, steel footplate, textured anti-slip finish. 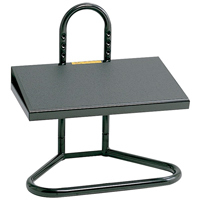 Set your Task Master Adjustable Foot Rest to the correct height. Your feet should be supported at such a height that your feet are resting comfortably on the footrest without tilting the chair forward or having to stretch to reach the footrest. However, ensure that the platform is not set too high as this will lift the thighs off the seat pan of the chair, reducing overall comfort while also tilting the pelvis backwards and adding undesired pressure to the lower lumbar region.